I've' had a good time at this year's Fujiama Party again and had the possibility to present WUDSN IDE to a lot of people. All of them are now happy "customers" with an environment where they can play around with assembler so easily. When I installed the previous version of the IDE, I found a bug in recent versions of Eclipse which is due to an incompatible change "plugin.xml" file handling. The bug causes the toolbar button to be invisible and locks up the "Customize Perspective" dialog. Therefore I decided to release a new version which contains all the fixes and round offs I have implemented in the past 12 months. Clicking on the link to a non existent file now asks for creating the file. This simplifies creation of includes during refactoring. 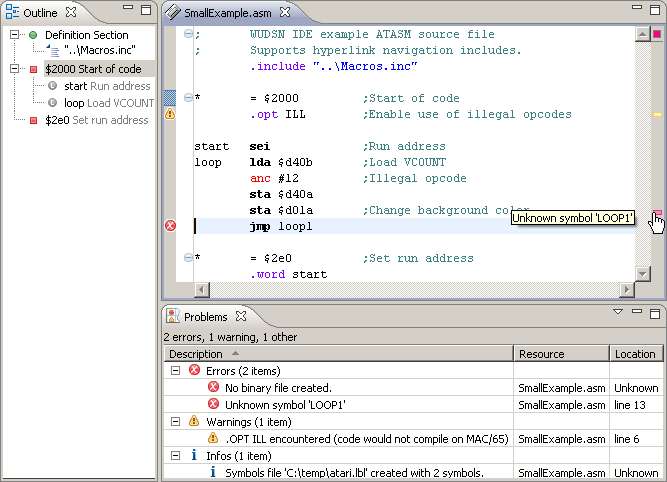 Section "Further information on assembler programming" added to the installation section of the IDE. The new section contains links to readily formatted source code includes and examples. Empty selection and too large number no longer lead to exceptions when opening the context menu for "Convert..."
Works fine for me with 23.0.1 in Win 8. Works fine for me in 23.0.1 in Win 8 with scripts from facebook.com blocked. I like to have my .nes output files go into a subfolder of the source file's folder called /nes/ . But because the IDE only looks for the output in either the source folder, the temp folder, or a fixed folder, there is no way that it can find the output file once it compiles. It throws a "output file not created" error in the error log, because it is looking in the wrong folder for the output. It would be nice if you could specify an output path that is relative to the source folder, and then I could avoid this problem. Why are they called urine cakes if you're NOT supposed to eat them? Thanks for the hint. It's due to the facebook script timing. After some investigation with people how are more into web than 6502 I figured out that the best way it to completely rework the scripting stuff and have separate pages (phew). Until then blocking the facebook script will help. Yes that's already planned and now has one more vote . I frequently have the same issue when I require different output file extensions (.com/.xex/.car/.bin) for my Atari stuff. In 1.6.0 I have added the feature that you can specify certain settings directly in the (main) source file via "@com.wudsn.ide.asm..." comments. I'll use the same for specifying the output folder/file name/extension and allow variables there also. The web-site has been relaunched using Joomla, so it should work properly now also on mobile etc. IE for some not yet known reason requires "compatibility mode" yet. The update which also allows specifying the output file properties (extension, name, folder) is about to be released. I found that the graphics editor and hex editor are not as usable as they should be. So I decided to implement some improvements and fixes first. At the same time quite a number of Mac OS X users reported issues with installing Java 1.7 on their machines, making it difficult for them to use WUDSN IDE. Hence I invested quite some time in reworking the code, so it runs properly also with "good old" Java 1.6. - This version can run with Java 1.6 (JRE/JDK), so also a vanilla OS X Snow Leopard (10.6), Lion (10.7), Mountain Lion (10.9) and Mavericks (10.9) can run it out of the box. - Improved handling of relative file paths in source and binary includes. - All buttons now have icons with tooltips. - Enabling of input fields and change detection is consistent now. - Typing into any file path of text field updates the dirty indicator immediately, so you see if there are unsaved changes. - Toggling the "Shrink" and "Zoom" buttons updates image size correctly now. - Line numbers have been added in the script editor. - The line with the cursor is highlighted in the script editor. - New default converter scripts for converting character sets have been added. - Error messages in case of script errors have been improved and the cursor is positioned to the error location in the source. 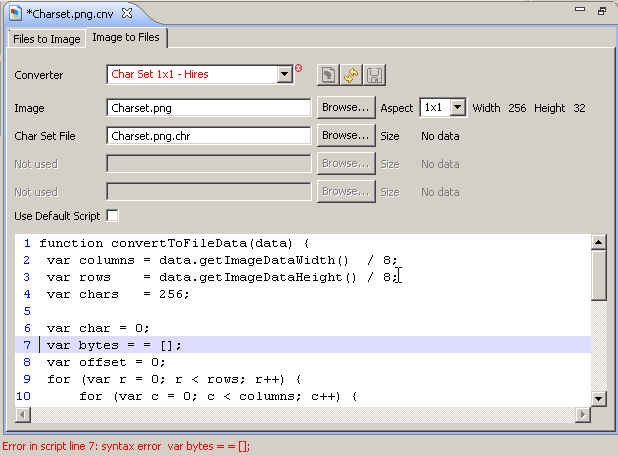 - Performance when opening a file with the HexEditor improved by a factor of 10 to 20. Now a file with 1 MB is opened in far less than 1 second. - Allowed maximum file size has been increased to 8 MB. - ATR files created from single Atari COM files, so called "k-files", are now detected automatically. For them not only the sectors of the ATR are displayed, but also the segments of the contain Atari COM file are displayed in the outline and the editor. - C64-PRG files are now detected automatically. Besides these already official features, the @com.wudsn.ide... annotation for controlling the output files are also actually included now. See http://www.wudsn.com/index.php/ide/feat ... nnotations for the details.